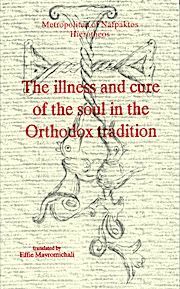 The author’s main conviction which permeats this present book is that Orthodoxy does not provide a “system” of moral conduct, but a therapeutic treatment which cures the innermost aspect of man’s personality. Metropolitan Vlachos maintains that he does not innovate by stating this, but that he just highlights a central teaching of the Fathers of the Church: man’s soul suffers malady which distorts his relationship to God, his fellow-men and even nature. Church is a hospital which receives all people and cures their spiritual illness.